« A Park for Bonobos? Do the Ancestors Want It? 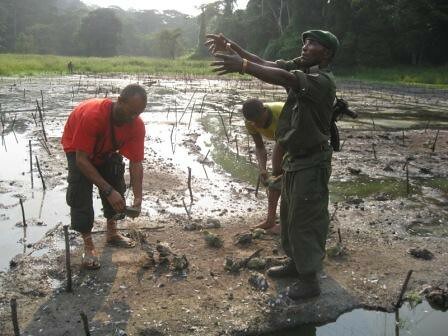 The evening catch was accumulating in the nets when Crispin and the guards arrived at Mont Ngaliemu. This was Crispin’s sixth trip to the forest salt-springs on the edge of the Loidjo River. These springs are visited by hundreds of mineral-seeking pigeons every day. On his first four trips Crispin had been the forest crier, carrying the word of conservation-to-come and warning the pigeon trappers that their business was illegal. Time to leave. On his fifth trip he was accompanied by military. They came with guns, and they emptied the camps, but still they let trappers and their families clear the nets, finish the smoking and carry out all of their dried pigeons on hundreds of neat little skewers. Crispin and the military told the trappers, however, that this was the end. No more trapping allowed in the camps. Any further trapping would lead to arrest. The guards crossed forest all morning and into the afternoon. That was in May. Crispin returned in early July with six of the newly arrived park guards. They walked all day west from the village of Oluwo , first to the pigeon camp of Mont Ngaliema and then across the Loidjo to the second camp of Mbula Likembe. The local Chief , to show his support accompanied them well into the forest. 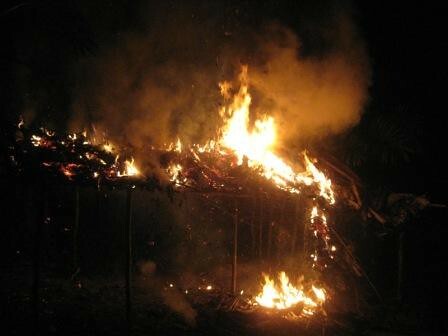 The houses were burned and the smoked pigeons piled up for a bonfire. This time there was no discussion. 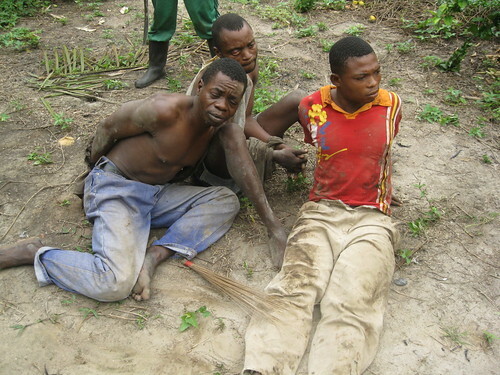 The three trappers at Mont Ngaliema were arrested. Their leader, Onombe Komando, had vehemently opposed the creation of a park at the recent community forum before the traditional tambiko. He and his compatriots had already smoked over one thousand pigeon-packed skewers. The guards made a bonfire of pigeons in the center of camp. The houses were emptied, and torched. On the left, Onombe Komando, was the leader and a long-time opponent to any hunting controls. Ground nets full of struggling pigeons filled the forest opening where the springs bubble out of the earth. This was – the evening catch. As many as possible were liberated , then the nets were burned. 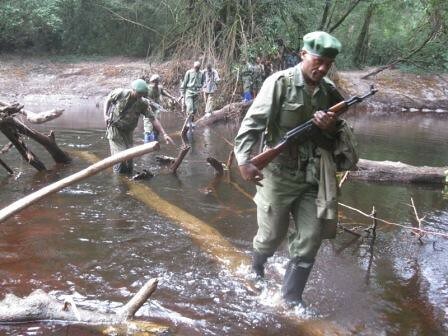 The prisoners were marched to the Loidjo River and on to the second camp, Mbula Likembe. They arrived as night fell. The camp was empty, but all the houses were torched. Komando said that no one had been there for a week. The camp burned into the night. The pigeons that were still alive at Mbula Likembe were liberated. Again the living pigeons were liberated. The prisoners collected the nets into a pile; it was set on fire. This entry was written by Terese Hart, posted on 2010-08-18 at 10:39 pm, filed under Bushmeat. Bookmark the permalink. Follow any comments here with the RSS feed for this post. Post a comment or leave a trackback: Trackback URL. exist possibilities for the locals to work for the park and how can it paid? Right now, TL2 as a project has hired local villagers as porters and some have come on more permanently with contracts as field assistants. The hope and plan is that as the ICCN park agency takes a more prominent role, local people will be hired as park guards and go on the State Payroll. What a wonderful job you are doing there!!! The pigeons and elephants in a few years will have more rights and protection than us Congolese people if they have not already!!! We do not hunt them for fun or as a distraction (safaries) like you do or used to do in some african countries (Talking about Europeans,Americans and others). Do you see those people hunting with high-tech equipment? Do you see them hunting for pleasure? Are they wealthy? No. I understand the fact that we have to protect the bio-diversity and the equilibrum of the nature, but please those people have families to feed, they are not in the Uk, Australia or other developed countries where they can received some sort of benefit or help from the government. Let me specify that I am not talking about those people chasing just for fun or a particular lucrative part of an animal. (eg: people chasing for Elephant horn or rhinoceros’s or any other animal) . Even those hunters do not do it for themselves, they do it for Americans, Chinese, Europeans or other raptors. Plus most of them did not have the chance to go to school, which means that they are less likely to be employed by companies or even by the government. We have been hunting for generations we do not have the culture of squandering, Europeans, Americans have. We hunt what we need of and full stop. And the most funny thing, is that you are very concerned by the fact that we hunt pigeons or other animals, but all the people killed, raped, or suffering because of this war going on, you do not give a damn! Oh!! maybe you do not know about it! Would you like me to tell you what is going on there?! We have more important than that. Love, Peace, Wealth, that is what we want for all congolese. We have to make education accessible for everyone, care for all congolese. There is more important to do than banning people from feeding themselves. Peace. Hope you understand my thoughts. I really understand your thoughts as I am Congolese like you and I am living in Congo. I am aware that the kind of life we have here is not good. The hunting is not necessary good activity. We had the richest bio-diversity in the world but some of our National Parks are losing their value because of poaching, the species we should protect are killed not by those persons who need food but because of commercial activities. Not all Congolese people eat bushmeat and I don’t agree with you that hunting can bring wellbeing to the hunters. 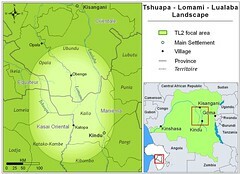 Congolese people need education, food and good health. This can be possible not by exterminating the bio-diversity left in our forests; we need to save this abundance (fauna and flora) in order to create touristic activities wich can help Congo gain credit in this field. To help those people, we must bring out positive initiatives and make them understand that what they are thinking by killing the fauna is not correct (The hunters are usually very poor, it is only the comercants that make some money). And by over-exploiting today, even they will not be able to make money tomorrow. The village wellbeing is not better; it will get worse because the forests become empty of animals. You can understand then that is not beneficial. Let’s protect our environment and make sure the coming generations live in good world. Thank you for understanding and supporting our activities! Can you tell me why during all these years of hunting in those villages they never wiped out the bio-diversity or the animals??!! Because they did not start hunting yersteday did they? Well I have to say that in terms of poaching and over-exploitation you are totally right we need to protect our richness. But for those families living in the heart of the forest how will they do to provide for themselves? Touristic activities… Well not really optimist about that one. You are doing a remarkable job, but I think that if you actually concentrate on catching the big fish (Real people making money out of poaching), all that will never happen again! Focus on those raptors brother. Please know there are many Americans who care very much for the welfare of the Congolese people –and the animals also – and the more educated we become, the more we care. Blogs like this help. Most people on the planet just want love, peace and wealth – we need to stick together. The real fear is commercial trade in bushmeat and there is no forest, except perhaps some swamp-forests where commercial trade in wild meat has not reached. If there is no commercial bush meat trade it is because it is well protected by local people or by park guards OR because the animals have already been essentially wiped out. Unfortunately there are already a lot of places like the latter. 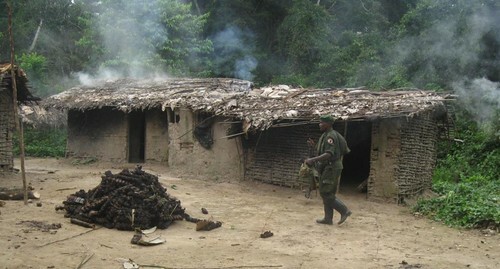 The war greatly increased commercial trade in bushmeat. Unfortunately even the national parks were severely hunted during the war and some of them still are. The result of the commercial trade is that even remote villages find it harder to find wild game to bring home for supper. There is good news though, too, and a lot of cooperation between local peoples once they realize what they are losing and how few people are really getting any profit from the trade. There is a lot to write about… One pretty exciting event is the participatory delimitation of a national park that took place in Maniema. I was not present, but I was given some great pictures and explanation. There is a lot to post. John and I are going to a conference in Japan (Primate Meeting) where we will talk about TL2 — so please excuse me if there is a pause before I get out another post. I did not know that Americans cared about other people espescially black!!!! Just a question: As I know life’s already difficult there, so what have you brought to those people, in order for them to provide for their families? I understand that you are probably not the root of their issues and all the problems they are facing, but as you have somehow restricted their activities, what’s there next? Is there something that could help them? Right. I see. Can you tell me why during all these years of hunting in those villages they never wiped out the bio-diversity or the animals??!! Because they did not start hunting yersteday did they? I grew up with bushmeat so did my father and his father… Well I have to say that in terms of poaching and over-exploitation you are totally right we need to protect our richness. But for those families living in the heart of the forest how will they do to provide for themselves? Touristic activities… Well not really optimist about that one. You are doing a remarkable job, but I think that if you actually concentrate on catching the big fish (Real people making money out of poaching), all that will never happen again! Focus on those raptors brother. Speak to you soon. L’effort de la communauté internationale pour la protection de l’environnement est indispensable pour la survie de l’humanités. cependant il est perçu par les communautés de base comme une restriction imposée dans leur de vie étant donnée que toute la survie est assis sur la nature ( peche chasse cueillette et culture). Le sentiment générale est qu’une grande importance est accordée aux richesses ou mieux aux ressources naturelles des sol et sous sol, qu’aux populations autochtones occupant ces espaces. Cela semble se justifier au moment ou des mesures généralement envisagées pour la prise en charge des populations locales en échanges des préjudices et sacrifice a consentir en terme de conservation de la faune flore et espèces rares sont a la fois inconséquents, inappropriées et souffrent d’un déficit de moralisation ou vulgarisations. – Inappropriés parce que les procédures utilisées laissent l,impression d’avoir dépossédé les villageois pourtant (très attaches) de leur terre. – Le déficit de l’éducation de base se pose pour la plupart des villageois, aggravé par ainsi par l’absence d’une vulgarisation savamment organisée contribuent à la réticence observée dans le chef des populations autochtones. Toutes les raisons évoquées ci dessus sont la causes des dérapages que l’on déplore notamment le braconnage et la non observance de différentes mesures liées à la protection de l’environnement. Au regard de tout ce qui précède la meilleur façon de faire c’est de rencontrer à fond les besoins des populations locales, créer un nouveau mode de vie à ceux-ci en assurant éducation, nourriture transport logement et sensibilisation. Si, une fois ces conditions sont réunis, l’adhésion sera totale et les populations bien éduquées verront l’auto gendarmes, l,objectif atteint, l’humanité sauvée, et même l’exode vers le nord arrêtée.